Stress cracks can occur in different forms. At the rod wire or steel bar they usually go in longitudinal direction and could be able to reach the core zone. They are often also only few hundredth millimeters deep. If the defects are very deep they are often wide open. However, there also are cases, particularly at drawn materials, where the cracks almost aren't recognizable on the surface. A stress crack can arise from too curt cooling after hardening or by unfavorable conditions after the hot forming. Smaller defects (rolling defect or slags in surface proximity) are often triggers for stress cracks on the material surface. 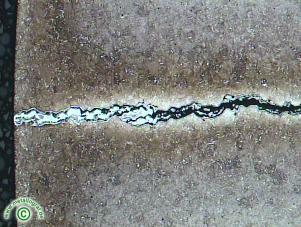 In the following sample the crack became triggered during the quenching of the material. During the later nitriding of the finished component the flanks of the crack became nitrided also.